I’m continuing my research on business disruptions, with a honed in focus on the Collaborative Economy, you can read all my posts on how this impacts corporations. 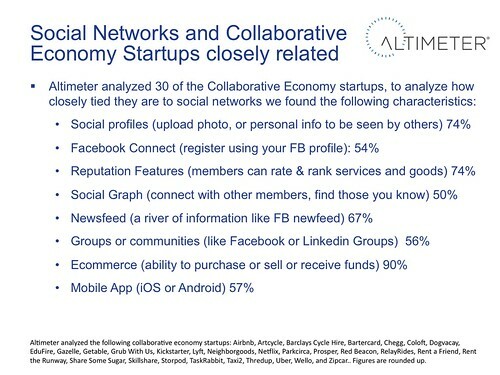 One of my thesis that I sought to test is the following: “Sharing startups in the collaborative economy are using social technologies”. To find out, we conducted research by analyzing 30 of the features on well known collaborative economy startups to find out the differences and similarities. What did we find? These sharing websites are utilizing a great deal of social technologies, but instead of sharing ideas, they’re sharing products and services. In fact, nearly 3/4 had social profiles and over half already had Facebook Connect, we should expect those rates to only increase as it spurs adoption. Like online social business communities hosted by Jive, Lithium, Bazaarvoice, Adobe, Mzinga, Telligent, GetSatisfaction or Uservoice, nearly 3/4 had reputation features to rate and rank experiences or other members. 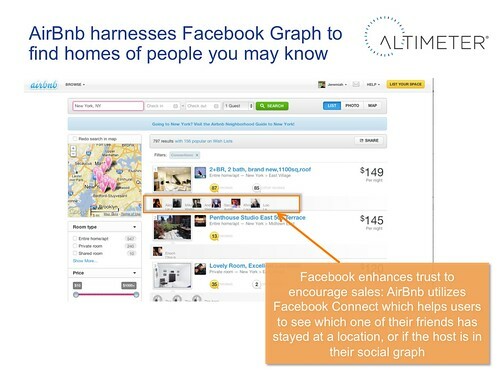 Above: See how AirBnb utilizes Facebook connect to find trusted reviews, and hosts who you may know and trust. 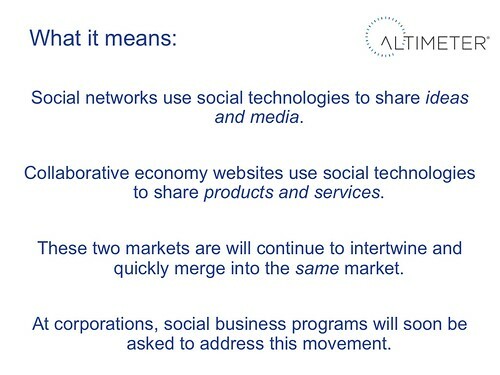 Above: As social data spills over to sharing economy startups, these markets will only further intertwine. What role do corporations play if customers buy once then share with each other? This is exactly the question I plan to answer. Last week, I shared on video how these markets are coming together to the Silicon Valley Business Journal, next week I’ll be keynoting LeWeb (after Etsy) and launching a report on this same topic. If you are in a social business career at a corporation, social software startup, or agency, you must pay attention to the sharing movement as this is the next phase in social business, Katie Soo sees it. If you are in social business, you must pay attention to the sharing movement —this is the next phase of your career.